Michelle Maloney’s talk- Australian Earth Laws Alliance– a summary. As Australian farmers and eaters struggle with a highly centralised food system controlled primarily by two major retailers, loss of access to processing facilities for all kinds of farmers, unfair and scale-inappropriate regulations and planning, and an increase in food insecurity in spite of wasting up to 40% of all food produced, our issues are mirrored elsewhere on the globe. 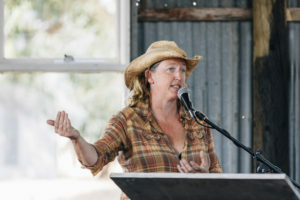 President of the Australian Food Sovereignty Alliance (AFSA) and local small-scale pastured pig and cattle farmer and butcher Tammi Jonas is recently returned from the gathering in Bilbao, Spain of La Via Campesina, the global movement of peasant farmers and fisherfolk, indigenous people, women, youth, and the landless, where she heard of the negative impacts of so-called free trade on smallholders everywhere, and the shared experience of loss of land tenure and access to processing facilities as fewer and fewer multi-national corporations own more and more of our food and agriculture systems. Tammi also attended meetings of the Food & Agriculture Organisation of the UN in Kuala Lumpur in early September on the use of biotechnologies in sustainable agriculture, where civil society expressed grave concerns at the abuse of power by corporate giants like Monsanto and CropLife that is destroying smallholders’ livelihoods globally. On a more hopeful note, Tammi has much to share on the strength and coordination of the global food sovereignty movement, and the hundreds of millions of smallholders working to feed their local communities fairly in the face of the challenges of industrialised food and agriculture systems and its proponents. Mt Alexander’s Eco-housing group will scope legal options, challenges and processes for eco-collaborative housing with local expert George Ryan. 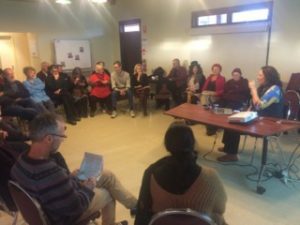 Discussion will focus on real life examples of people wanting to share their land and/or subdivide with the intention of neighbourly connection and mutual support. Liz from Musk and Margaret from Castlemaine will describe their quite different land situations, visions and questions. George will discuss some of the practical and theoretical details that they might need to consider. There will be time to discuss ideas and examples raised by those attending. A night under the stars at beautiful Lot 19 with some of our finest local acts supporting our West Papuan friends, to raise awareness of the genocide and human rights abuses in West Papua, Australia’s closest neighbour. Come and meet members of the West Papuan community who will be coming up from Melbourne to play music and share their stories and a couple of short films. 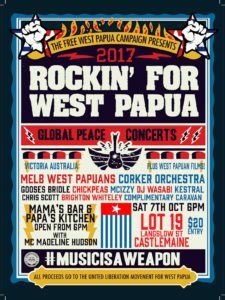 Listen to a collection of local performers as well as the West Papuan group from Melbourne featuring members of the Black Orchid Stringband. Locals include The Gooses Bridle (harmony based, quirky, uke driven music from Guildford), The Chick Peas (seven havoc makers wielding anything from ukes to trombones), Brighton Whitely (the inventor of synthetic cabaret), Chris Scott (playing his song for West Papua), Kestral (harmonic singing & unique rhythmic guitar) and local DJ Wasabi will be joining MC Izzy (from Combat Wombat) for some edgy hiphop. When and Where: 7.30pm, Wednesday October 11th at Cafe re-PUBLIC (back room), 26 Templeton St, Castlemaine. This month’s focus will be: The Republic- an opportunity to do democracy better, with Cathy Wheel and Michael Scott. 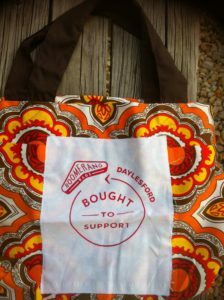 Locals living in Daylesford and Castlemaine, along with many other communities around Australia, are sewing and distributing boomerang bags. Join others seeking a plastic bag free world by sewing boomerang bags after Castlemaine’s Repair Cafe, from 1.pm to 4.pm, on Sunday October 29th, at Ray Bradfield Rm in Castlemaine. Localising Leanganook was delighted to welcome Dr Michelle Maloney to Castlemaine in August. Co-founder and National Convener of the Australian Earth Law Alliance (ALEA), Michelle commenced her presentation by describing current challenges in the global context, reminding us that humans are pushing the limits of numerous planetary boundaries, that designate a safe operating space for humanity within the living earth system. These boundaries include biodiversity integrity and global freshwater. Four out of nine boundaries have been crossed. She drew on the example of climate change thresholds being breached, where in the summer of 2013 extraordinary heat levels required a new colour to be added to BOM maps. She also reminded us that by 2030 we would need 4.8 planets to support the global population if everyone consumed at the rate of Australians. How did we get into this situation? She said the perfect storm started with the industrial revolution, with great acceleration taking off in the 1950’s driven by exploitation of ‘cheap’ fossil fuels. The crisis we face is inspiring the emergence of new ideas to achieve harmony with nature, in science, art, politics and law and governance. The emergence of Earth Jurisprudence is one bloom, now flowering on the tree of humanity at this time of crisis. Jurisprudence is a theory of law. The ‘father’ of the earth jurisprudence movement was Thomas Berry, who inspired thousands of people to find new relationships with earth, drawing on the deep wisdom on Indigenous cultures. He called for Rights for Nature.Berry pointed to ideas that lie beneath political, economic and social/cultural institutions – the anthropocentrism and pro-growth hegemony that is embedded within current societies. He called for Earth Jurisprudence, shifting our governance systems from human-centred to earth-centred. Governance must be a central focus as we move forward, both formally and informally, within families, organizations, governments. In 2002 Cormac Cullinan developed the ‘Wild Law’ manifesto answering the call of Berry for the development of Rights of Nature. While our current system of environmental law has made some progress, according to Michelle ‘it just mitigates around the edges of the problem’. Because it is based within the existing anthropocentric/pro-growth paradigm, the earth continues to deteriorate. Meanwhile the Earth Law movement is burgeoning with a growing list of laws being implemented around the world. ALEA is leading the movement in Australia with five core areas of work: building community, creating alternatives (e.g. new economy network), transforming law (e.g. GreenPrints project, ecocide), reconnecting to what matters (e.g. science, ethics) and changing culture (e.g. education, earth arts). Michelle shared stories of ALEA initiatives, including the recent Earth Law Tribunal in Brisbane this year. Finally, Michelle introduced us to the Green Prints initiative, which is being designed for civil society and advocacy. Green Prints weaves together existing successful approaches including ecological footprint, new economy, transition towns etc., within an Earth systems science, earth law framework and using a bioregional/localisation approach to develop templates for living with harmony with nature. Those who attended came away inspired.